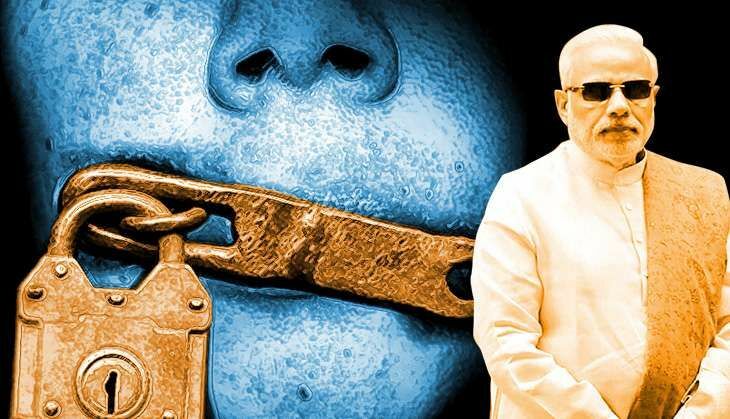 Paranoid about its desire to crush any sort of dissent, the BJP government in Gujarat is now toying with the idea of bringing in one more law to nip its critics in the bud. A legislation, to be introduced and intended to be passed during the next session of the Legislative Assembly, would empower the police to arrest any one on mere 'suspicion' that he or she could pose a potential threat to Gujarat's internal security. Not only that, any citizen can be picked up by police merely on 'suspicion' - the law proposes to grant immunity from prosecution to the police and the administration for doing so. The GujCTOC, which the new law seeks to imitate, was the bone of contention between Chief Minister Narendra Modi and the Congress-led UPA government at the Centre for many years. The BJP government has failed in three previous attempts to bring in a law similar to the present draft, tentatively titled the Gujarat Protection of Internal Security Act (GPISA). Three successive Presidents have refused to give a nod to such an Act. The current President, Pranab Mukherjee, returned the Gujarat Control of Terrorism and Organised Crime (GujCTOC) last year, following complaints by human rights organisations and Opposition parties about its stringent provisions. Since 2003, when it was first passed by the Gujarat Legislative Assembly with Narendra Modi as the Chief Minister, this legislation was sent back twice for dilution - by President APJ Abdul Kalam and by his successor President Pratibha Patil - precisely because the stringent provisions violated basic human rights of the citizens. This time, too, the provisions of the GPISA make arrest on 'suspicion' a cognisable and non-bailable offence, with the police and administration enjoying immunity from facing claims of damages even if the citizen is honourably acquitted after a trial. No wonder, then, that civil society and human rights activists are fuming about the new law. Many have once again described it as 'draconian'. Vowing to oppose the legislation vehemently, human rights activist Mujahid Nafees said the proposed law is more or less the same as the GujCTOC, with some new provisions like installing surveillance cameras at any private and public places. Nafees added the government is trying to sneak in this law as it has realised it cannot bring in the GujCTOC once again. Nafees who was one of the organisers of the recent national convention of people's rights on land, forest, mines and water. "By arresting merely on suspicion, the government wants to crush all dissent and take away the minimum human rights to express one's views," he commented. Prof. (retired) Prakash Shah, convenor of the Movement for Secular Democracy (MSD), said the proposed law had 'draconian' dimensions. He said the government probably wanted to put psychological pressure on dissenters with this law, as there are enough existing laws to ensure internal security in the state and the country. Shah also hinted that the proposed law is bound to be misused, because the present government's definition of 'treason' and 'sedition' are partisan. Recalling that the Supreme Court has passed severe strictures against such draconian laws, he hoped that the new legislation would not come into force. Shah also said that if the government really had the political will to ensure internal security, the existing laws were enough to deal with the mischief makers.